After its successful race programme with its MX-5 GT, Mazda will be showing a 205PS street legal version of the MX-5 GT at the Goodwood Festival of Speed. The suspension of the Mazda MX-5 GT has been uprated to improve handling and is adjustable for different track conditions. Aerodynamics are courtesy of a carbon front splitter, a rear diffuser and boot spoiler. The exhaust note has been enhanced with a central tailpipe sports exhaust system. Recaro seats keep the driver and passenger in place and some parts of the interior trim are carbon fibre to help reduce weight. For drivers who want to use the car for track-day, it comes equipped with street legal semi 'slick' tyres and body-coloured roll hoops behind the seats. Joining the street legal MX-5 GT on the Mazda stand will be the Mazda Takeri sedan concept, giving a good idea of the next SKYACTIV production model Mazda6. Mazda will also be showing the Mazda CX-5 compact SUV, the first to adopt Mazda's SKYACTIV technology that improves fuel economy and reduces CO2emissions. 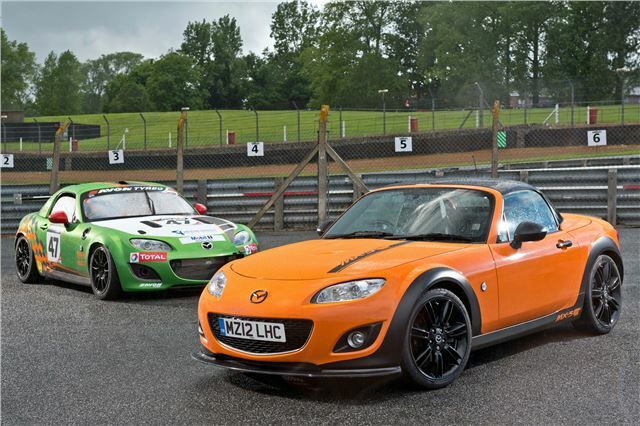 Mazda has also entered the Jota Sport Mazda MX-5 GT4 in the Goodwood hillclimb. Sponsored by SMH Fleet Solutions, Jota Aviation, Total Lubricants and Mazda Financial Services, the Jota Sport Mazda MX-5 GT4 is currently contesting the 2012 British GT Championship and recently took third in class at Brands Hatch. Racting against Lotus, Aston Martin, Ginetta and Ferrari racecars, the MX-5 GT has a top speed of 160mph and a race- car 0-60 time of just three seconds. Regular Mazda racers Mark Ticehurst will be driving along with former race champion and current Auto Express road tester Owen Mildenhall together with 19 year old kart racer Jade Paveley.